Freezer Steel Cut Oats made with your favorite mix-ins for those mornings when you need a quick, comforting and healthy breakfast. I am officially back into the swing of things. The kids are all back to school and all is right in the world! For me, it’s really just a matter of there being more structure in my days that makes me enjoy this time so much. Of course, with all the added activities, including early mornings, it can be overwhelming, especially when some of us may not have even bothered with an alarm clock all summer. So…to help your mornings run smoother, these Freezer Steel Cut Oats To-Go will help you start your day off in an EASY and HEALTHY way. It starts with making your own pre-made, freezable breakfast. 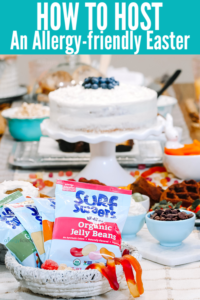 And you’ll be happy to know this freezer friendly meal DOES NOT include sugar (unless you count it in the fruit) and it is also dairy free, gluten free, nut free, vegan, & paleo-friendly. Talk about making everyone happy! So this is how you do it…..
Batch cook your oats. It may be the weekend or the night before, but you will need to create enough time margin to make the oats of your choice. 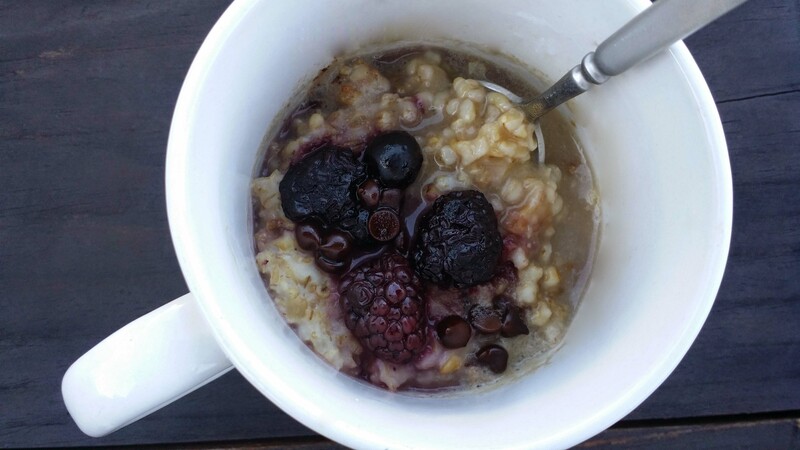 Rolled oats may be an option if time is really limited, but if you can, go for the Steel Cut Oats. They are higher in nutrient value, fiber and hold on to a more chewy, nutty-like texture compared to regular oats. 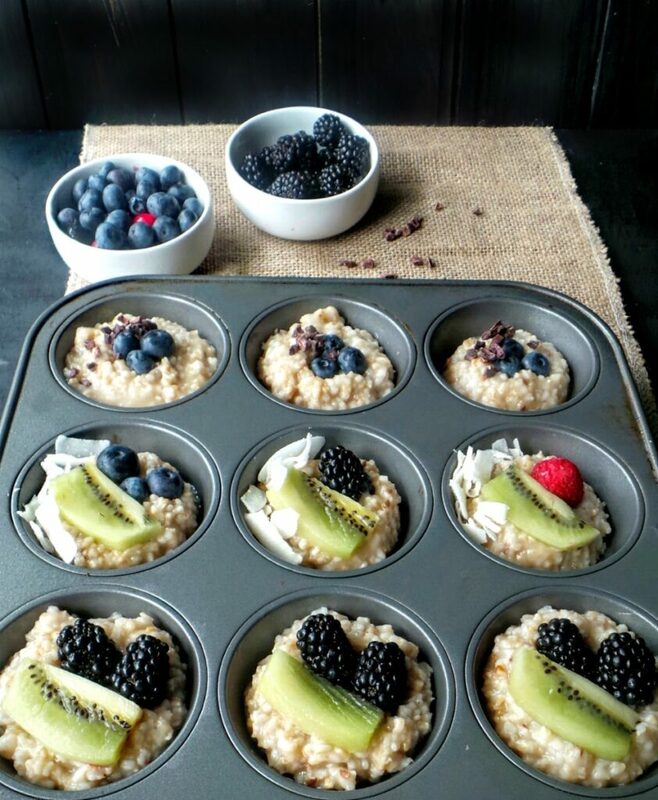 Once your oats are made, scoop approximately 1/3 into lightly sprayed muffin tins and top with whatever you love. Get your kids involved too and let them create their own flavors. Use chopped fruit or berries, nuts (if you’re not allergic), seeds, coconut shreds, cacao nibs, vegan chocolate chips or even dried fruit like dates or cranberries. Whatever makes your mouths smile! Just be sure to press them in a little to make sure the berries don’t go rolling off. Place in the entire tin in the freezer for at least 2 hours so the oats can form together in a muffin shape (don’t worry if you forget them overnight, it’ll still work just fine). Don’t you love how easy this is? Just like this Instant Pot Creamy Pumpkin Maple Oats recipe from Meaningful Eats! Don’t worry, the name of the recipe is longer than it takes to make it . Once they are frozen, take them out and let them thaw at least 5 minutes so they can easily be removed from the tin. Then, they can be individually packaged or grab a large bag and put them all together. 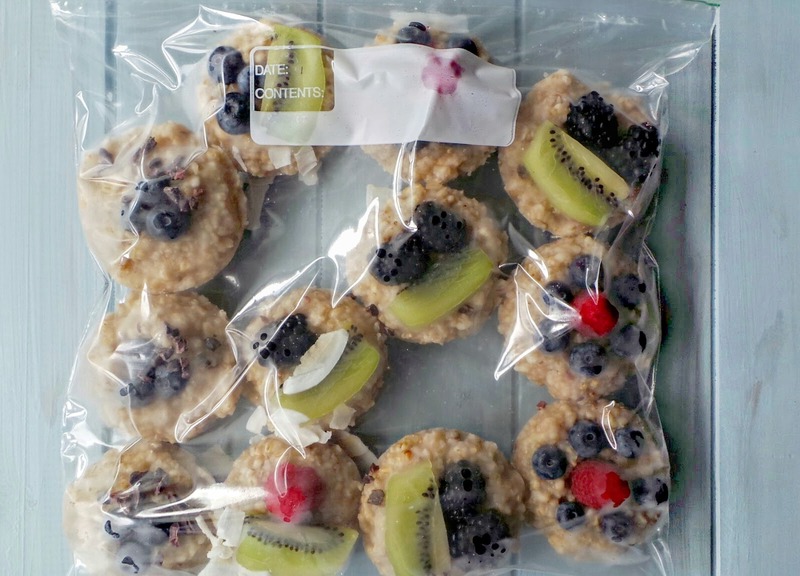 Better yet, give each family member their own labeled freezer bag to fill up with their own oatmeal creations. What mix-ins would you add to your Freezer Steel Cut Oats to-go? Berries, chocolate, maple syrup, potato purée? I’d love to hear your ideas so be sure to comment below. 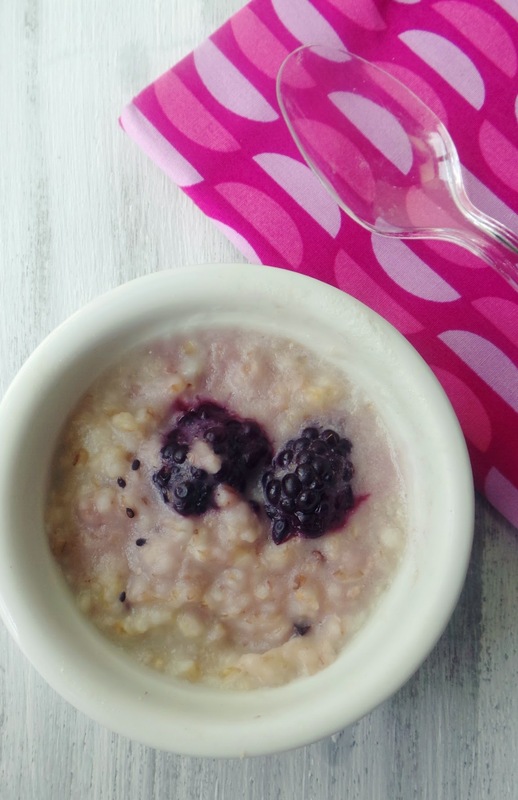 Freezable Steel Cut Oats made with your favorite mix-ins for those mornings when you need a quick, comforting and healthy breakfast. 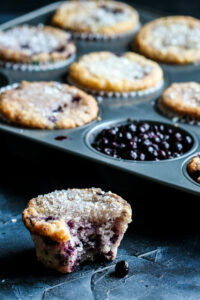 Lightly spray muffin tin with no-stick spray. Bring water and salt to a boil. Add in Steel Cut Oats. Reduce to a simmer and cook, stirring frequently, until soft and ready to eat, 10 to 20 minutes, depending on how chewy you like your oats. Divide the oatmeal evenly into the cups of the muffin pan. Top with the berries, chopped fruits, seeds, cacao nibs, pressing lightly to make sure they are embedded in the oatmeal. 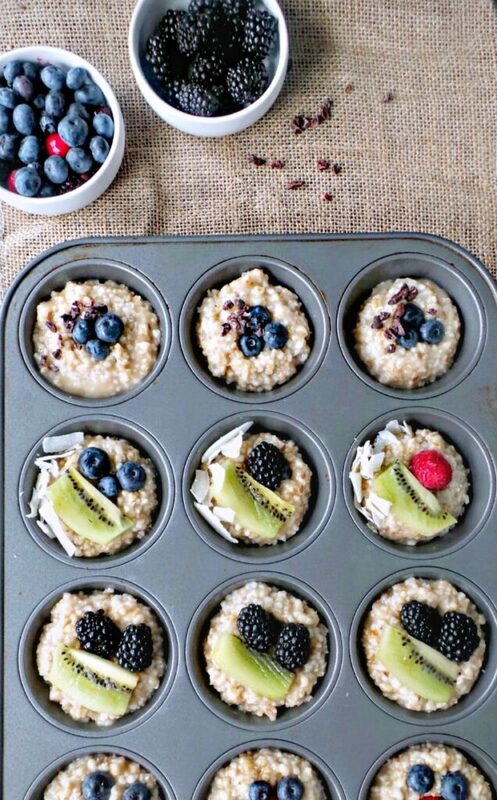 Place the muffin pan in the freezer until oatmeal is fully frozen, at least 2 hours. Remove and allow to thaw slightly (5 min), until the oatmeal can be popped out of the pan with a thin butter knife. Wrap the oatmeal in freezer-safe packaging and freeze. To eat, remove the desired number of pucks and warm in a bowl in the microwave for 1 to 2 minutes. 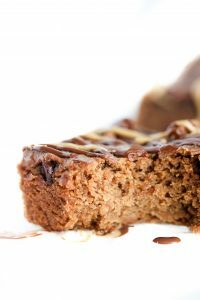 Serving Suggestions: Serve with non-dairy milk or butter.Add brown sugar, maple syrup or agave to sweeten.Don’t forget to add a sprinkle of cinnamon, pumpkin pie spice if desired.